Is IELTS Exam Mandatory for PR Visa Application? - Gateway to Canada | Canada Immigration Consultancy! Is IELTS Exam Mandatory for PR Visa Application? The answer is NO. IELTS Examination is not mandatory. 1. Take the IELTS Examination. Information regarding the IELTS examination may be found HERE. Your IELTS examination result is conclusive and the other option will be subject to Visa Officer's evaluation. If you can clearly establish your language proficiency level by means of alternative documentation, you don't need to take the IELTS examination. But what if you have submitted alternative documents and you were still required to take the IELTS examination? In that case, the most logical thing to do is take the IELTS examination! Prior to the implementation of your Simplified Application Process (Sept 2006), all original documents are being required at the time of filing of application. That includes the proof on your language proficiency. But prior to making a decision, the Visa Officer will require you to update certain documents like your employment certificate, NBI Clearance, personal net worth statement, etc. You may also be encourage to take the IELTS examination, as it is the best proof of language skills. What happens if you don't take the IELTS examination? Based on experience, you will be given only 8 points on the average. We actually have a physician client who was given only 8 points! But of course, we made an appeal and successfully won the case. The maximum for English Language proficiency is 16 points. Below is the equivalent points of your IELTS Examination result. 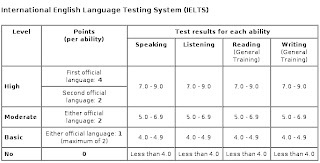 To get the maximum points for each area, your IELTS Score for each area must be at least 7.0. If you have a pending PR Visa application and is still waiting for the embassy notice to update your documents, it is best that you prepare yourself for the IELTS Examination. It is best if you will take an IELTS Review and Test Simulation before writing the IELTS Exxam even if it is not mandatory.